Staff Selection Commission(SSC) has published Important News today on 31st January 2018. In this News, SSC has mentioned timeline of Examinations conducted during the last week, Examinations to be conducted by the Commission in the month of February 2018,Results declared during the last week and Results to be declared by the Commission during the month of February 2018. Staff Selection Commission(SSC) has released Result Status Report of its recruitment examinations today on 31st January 2018. SSC will declare result of Constable (Executive) Delhi Police 2016 (Written Examination), Scientific Assistant in IMD Examination,2017 (Written Examination), Combined Higher Secondary Level (10+2) Examination, 2016(Final Result) and Junior Engineer (Civil, Mechanical, Electrical,Quantity Surveying and Contract)Examination-2016 (Final Result) on 09th February 2018, 13th February 2018, 16th February 2018 and 28th February 2018 respectively. 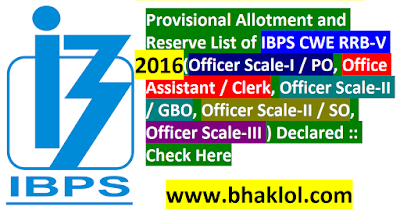 Dear Students, Institute of Banking and Personnel Selection(IBPS) has released Provisional Allotment and Reserve List of IBPS CWE RRB-V 2016(Officer Scale-I / PO, Office Assistant / Clerk, Officer Scale-II / GBO,Officer Scale-II / SO,Officer Scale-III ). State Bank of India invites Online applications from Indian citizens for appointment in following Positions in Specialist Cadre Officers for Wealth Management in State Bank of India. Online Registration of Application and Payment of Fee will be taken from 31st January 2018 to 15th February 2018. Dear Students, Syndicate Bank has announced new exam date for the admission to one year PGDBF(Post Graduate Diploma in Banking and Finance). Syndicate Bank has extended Online Examination Date due to General Election to the Legislative Assembly of Tripura. Dear Students, admit card of SSC CGL Tier-2 2017 Online Examination has been released now, examination starts from 17th February 2018. We are sharing Exam Dates and Shift Timings of SSC Combined Graduate Level Examination, 2017 (Tier-II)- Paper-01(Quantitative Abilities), Paper-02(English Language and Comprehension), Paper-03(Statistics) and Paper-04(General Studies-Finance and Economics). The Reserve Bank of India invites applications from eligible candidates for 27 posts of “Assistant” in various offices of the Bank. 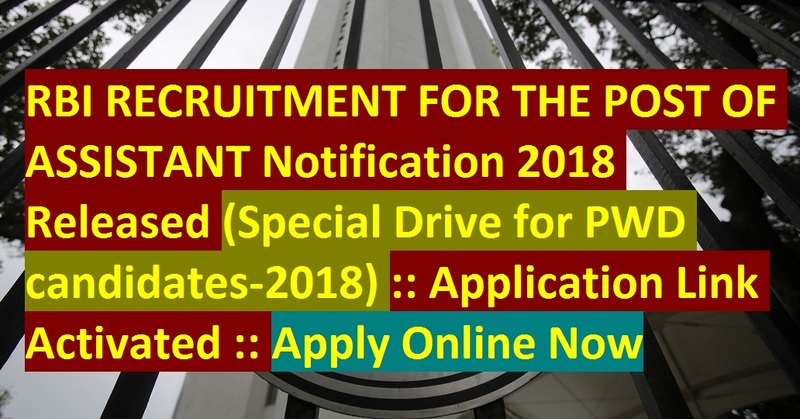 Selection for the post (Special Drive for PWD candidates-2018) will be through a country-wide competitive examination in two phases i.e. Preliminary and Main examination followed by a Language Proficiency Test (LPT). Staff Selection Commission(SSC) has released Computer Based Examination Dates and Shift Timings for SSC Phase-V/2017 for Selection Post. For Matric Level Posts, Online examination will be conducted on 08.02.2018 in the shift of 10:00 AM to 11:00 AM. For Graduate Level Posts Online examination will be conducted on 15.02.2018 in the shift of 10:00 AM to 11:00 AM. For Higher Secondary Level Posts, Online examination will be conducted on 24.02.2018 in the shift of 10:00 AM to 11:00 AM. Dear Students, Staff Selection Commission(SSC) has released Admit Card for for Central Region (CR) SSC CGL Tier-2 2017 Online Examination which is scheduled to be conducted from 17th February 2018. If You Have Opted Your Exam Centre In UP and Bihar then you may download your admit card for CGL Tier-2 2017 Online Examination from the link given below. Staff Selection Commission(SSC) has released Result of Paper-II(Recruitment of Sub-Inspectors in Delhi Police, CAPFs and Assistant Sub-Inspectors in CISF Examination, 2017) for short listing candidates for Medical Examination. Cut off marks in SSC CPO Paper-I + Paper-II for Unreserved Male candidates is 293.50 and Cut off marks in SSC CPO Paper-I + Paper-II for Unreserved Female candidates is 264.75. 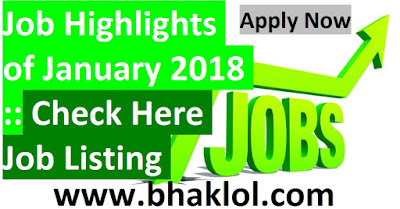 Dear Students, Uttar Pradesh Power Corporation Limited(UPPCL) has released admit card for the examinations of Stenographer Grade-III, Office Assistant Grade-III, APS(Additional Private Secretary), APS(Additional Private Secretary) Department ,Assistant Reviewing Officers(ARO) and Office Assistant Grade-III(Account). 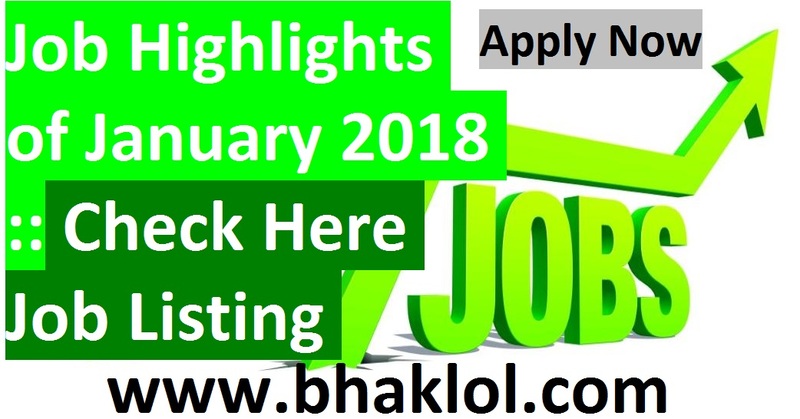 Dear Students, We are sharing Job Highlights of January 2018. We are sharing name of the recruiting body, name of the post/designation, Number of Vacancies and the closing date to apply online for that post. You may visit official website of recruiting body for detailed recruitment advertisement. Dear Students, SBI Clerk 2018 Mains Online Examination will be conducted on 12th May 2018. We are sharing Weightage and Marks Distribution of All Subjects viz. GA/GK/GS, Reasoning Ability, English Language, Computer Aptitude and Quantitative Aptitude, Topic-wise for SBI Clerk Mains 2018. We are sharing Complete Score Structure of SBI Clerk Mains 2018 Online Examination which will help you to score more marks to opt the SBI Clerk 2018 Job. Dear Students, SBI Clerk 2018 Preliminary Online Examination will be conducted in March/April 2018. We are sharing Weightage and Marks Distribution of All Subjects viz. Reasoning Ability, English Language and Numerical Ability Topic-wise for SBI Clerk Prelims 2018. We are sharing Complete Score Structure of SBI Clerk Prelims 2018 Online Examination which will help you to score more marks to qualify for SBI Clerk Mains 2018 which is held on 12th May 2018. Dear Students, Today on 28th January 2018, SSC MTS(Multi-Tasking)-Non-Technical Paper-2/Tier-2 / Mains examination was conducted. Overall paper was easy. Now we are sharing Letter Writing and Essay which are Asked in today's SSC MTS Tier-2 Examination which will be very helpful for new SSC Aspirants. 1.Write an Essay on Rainy Season. 2.Write an essay on Mobiles. Dear Students, SSC MTS Tier-2(Descriptive Test - Letter Writing and Essay) 2016 was held today on 28.01.2018, Sunday from 11:00am to 11:30am. Now the students who took this examination , please share the review. 1. How many Letter Writing Asked? 2. How many Essay Asked? 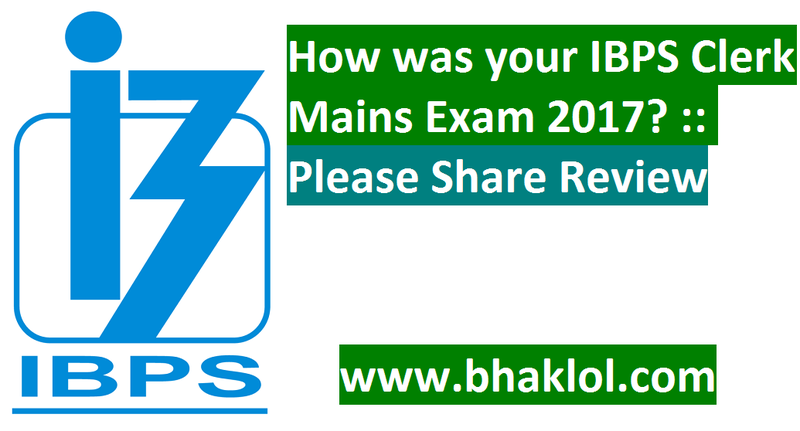 Dear Students, IBPS SO Mains 2017 Online Examination conducted today on 28th January 2018. Reporting Time was at 09:00AM. 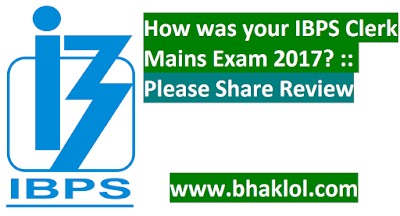 Examination is over, Now the students who took this examination , please share the review. Dear Students, State Bank of India has made few changes in its SBI Clerk 2018 Exam Pattern. We are sharing New Exam Pattern and Syllabus SBI Clerk 2018 Preliminary and Mains Online Examination. As per notification released by SBI, its Clerk Prelims Online Examination is expected to be conducted in the last week of March 2018 or First Week of April 2018. SBI Clerk Mains 2018 Online Examination will be conducted on 12th May 2018. 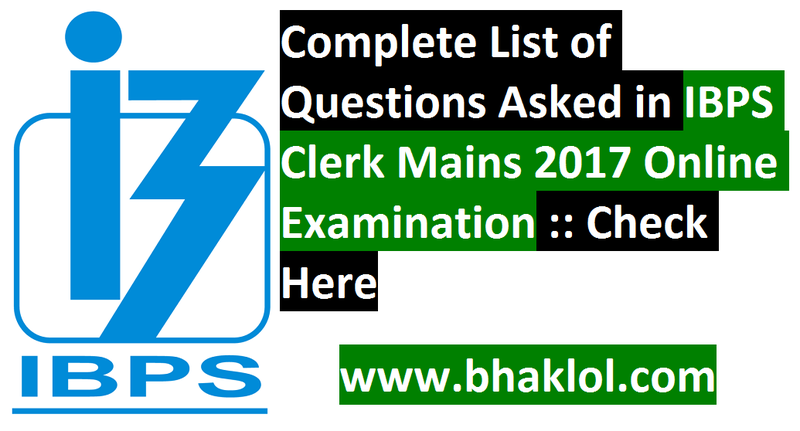 We are sharing latest exam pattern of SBI Clerk Prelims as well as SBI Clerk Mains. Also sharing the syllabus of both stages exams of SBI Clerk 2018. All these topics have been asked in the recent years examinations of SBI Clerk Recruitment. Therefore, its too need for all the aspirants to become aware from all these topics indicted below. 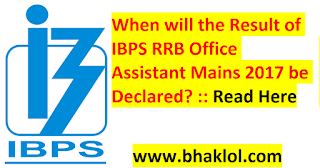 Dear Students, we all are waiting for the result IBPS RRB Office Assistant Mains 2017 Online Examination which was conducted on 12th November 2017. Institute of Banking and Personnel Selection(IBPS) has declared all the examinations conducted before this exam(IBPS RRB Office Assistant Mains 2017 Online Examination) and after this exam(IBPS RRB Office Assistant Mains 2017 Online Examination). 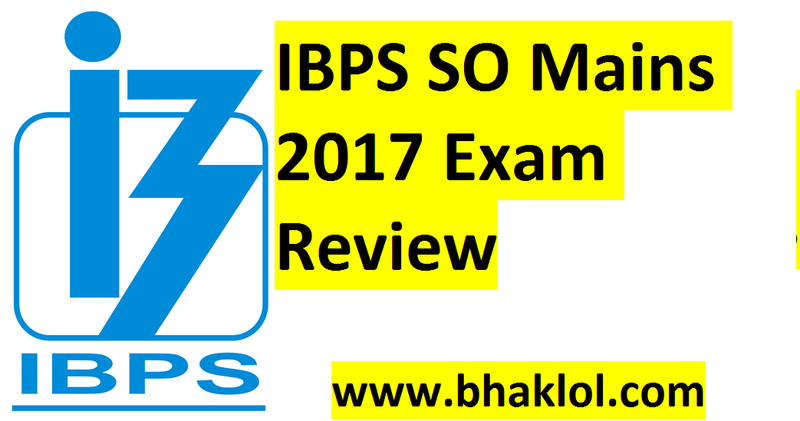 IBPS PO Mains 2017 was conducted on 26th November, its result and score card are declared. Result and Score of IBPS RRB Officer Scale-I, II, and III are declared. 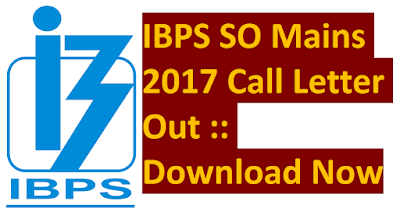 Result and Score of IBPS SO Prelims 2017 is declared. 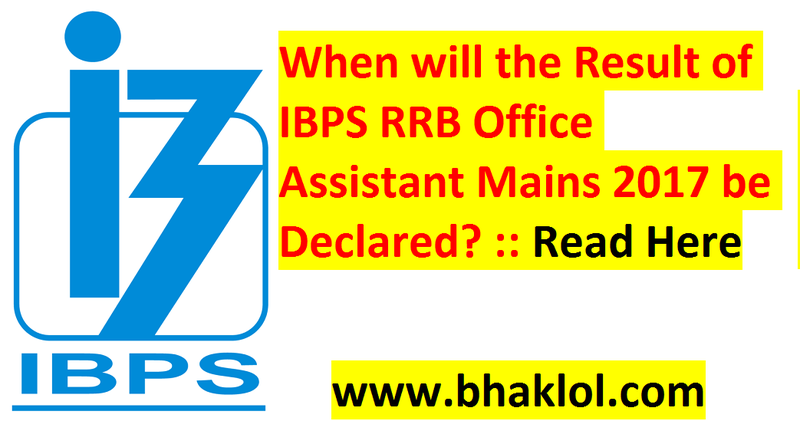 Now also Result and Score of IBPS RRB Office Assistant Mains 2017 Online Examination is declared. Staff Selection Commission(SSC) has released Final Answer Key of SSC MTS Paper-1 2016 Online Examination. The Commission has uploaded the Final Answer Keys alongwith Question Papers on the website of the Commission on 25.01.2018. The Candidates may take a print out of their respective Question Papers alongwith Final Answer Keys. This facility will be available for the candidates from 25.01.2018 to 24.02.2018 (5:00 PM). Staff Selection Commission(SSC) has released Revised Final Answer Key of SSC CGL Tier-01 2017 Online Examination. The Commission has uploaded the Revised Final Answer keys alongwith Question Paper(s) on the website of the Commission on 24.01.2018. Candidates may take a print out of their respective Question Paper(s) alongwith the Final Answer Keys. This Facility will be available for the candidates upto 5.00 P.M. of 23.02.2018. Reserve Bank of India(RBI) has released advertisement for the recruitment of Assistant Officers(AO) in various offices of the Bank. Eligible and Interested candidates may apply online from 30th January 2018. ECGC PO 2018 Examination Admit Card Released :: Download Now! ECGC Limited(A Government of India Enterprise) has released admit card for its PO(Probationary Officers) Recruitment 2018 Online Test which is scheduled to be conducted on 06th February 2018, Tuesday. All the candidates who applied for this PO recruitment, can download his/her call letter/hall ticket from the link given below. The Oriental Insurance Company Limited(OICL) has released interview call letter for the recruitment of 300 Administrative Officers(AO) Scale-I 2017-18. All the shortlisted candidates for interview can download his/her call letter from the link mentioned below. MP High Court 2017 Admit Card Released for Screening Interview of Driver, Peon, Watchman, Waterman, Gardener and Sweeper :: Download Now! Madhya Pradesh High Court has released Admit Card For the Screening Interview of Class-IV contingent posts of Driver, Peon, Watchman, Waterman, Gardener & Sweeper for the Establishment of District Courts of M.P.-2017(चतुर्थ श्रेणी कलेक्ट्रेट रेट/आकस्मिकता निधि से वेतनभोगी कर्मचारी वाहन चालक/भृत्य/चौकीदार/जलवाहक/माली/स्वी पर के पद पर नियुक्ति हेतु स्क्रीनिंग साक्षात्कार वर्ष-2017). Dear Students, The National Board of Examinations(NBE) has released result of NEET PG 2018 Examination which was conducted on 07th January 2018, Sunday. ECGC Limited(A Government of India Enterprise) has announced dates of its PO Recruitment 2018 Examination. Examination will be conducted online. Online written examination for the post of Probationary Officer 2018-19 is scheduled to be held on Tuesday, 06th February 2018. Dear Candidates, Staff Selection Commission(SSC) has cancelled off BATCH-I OF JUNIOR ENGINEERS (CIVIL,MECHANICAL, ELECTRICAL AND QUANTITY SURVEYING & CONTRACT)EXAMINATION, 2017 (PAPER-I) SCHEDULED ON 22.01.2018 FROM 10.30 A.M. TO 12.30 P.M AT DR. K.V SUBBA REDDY INSTITUTE OF MANAGEMENT (CENTRE CODE: 518218C), KURNOOL – 518218. SSC has stated in a notice, "DUE TO TECHNICAL PROBLEMS, BATCH-I OF JUNIOR ENGINEERS (CIVIL,MECHANICAL, ELECTRICAL AND QUANTITY SURVEYING & CONTRACT)EXAMINATION, 2017 (PAPER-I) SCHEDULED ON 22.01.2018 FROM 10.30 A.M. TO 12.30 P.M AT DR. K.V SUBBA REDDY INSTITUTE OF MANAGEMENT (CENTRE CODE: 518218C), KURNOOL – 518218, HAS BEEN CALLED OFF." Dear Students, Admit Card of SSC MTS(Multi-Tasking) Non-Technical 2016 Paper-2 has been released. Descriptive Test of SSC MTS Tier-2 2016 will be of 30 minutes. We are sharing SSC MTS(Multi-Tasking) 2016 Tier-2 exam Dates and Shift Timings. Q1. Which state has the highest area under forest in India? Q2. How many chambers are there in human heart? Q3. What conditions lead to hypermetropis? Q4. Which country will host Summer Olympics? Q5. Hieun tsang the Chinese traveler travelled in India during? Q6. Who won Davis cup 2017? IDBI Bank has released call letter for the interview of all the shortlisted candidates in online test which was conducted on 03.02.2017. All the candidates who will be selected in interview will get admission in Manipal PO PGDBF(Post Graduate Diploma in Banking and Finance) Course. Dear Students, We are sharing SSC JE(Junior Engineer) Prelims 2017 Examination's Analysis which was conducted on 22nd January 2018. Questions of reasoning was of easy to moderate level. No new types of questions asked in reasoning sections.GK questions was also of moderate level. Around 10 questions from Current Affairs asked in GK Sections. Core subjects was of easy to moderate level. More than 50 questions can be attempted in Core subjects. Staff Selection Commission(SSC) has released admit card for its JE 2017-2018 Prelims Online Examination which starts from 22nd Jan 2018. Now, We are sharing SSC JE(Junior Engineer) Prelims 2017 Examination Dates and Shift Timings. This year, SSC conducts its JE Preliminary Examinations i.e. SSC JE Pre 2017 in six days consisting of two shifts in a day. We are sharing timings of all the shifts. Staff Selection Commission(SSC) has released its JE(Junior Engineer) Preliminary Online Examination 2017 Admit Card. Online Examination starts from 22nd January 2018 and it will go till 29th January 2018. 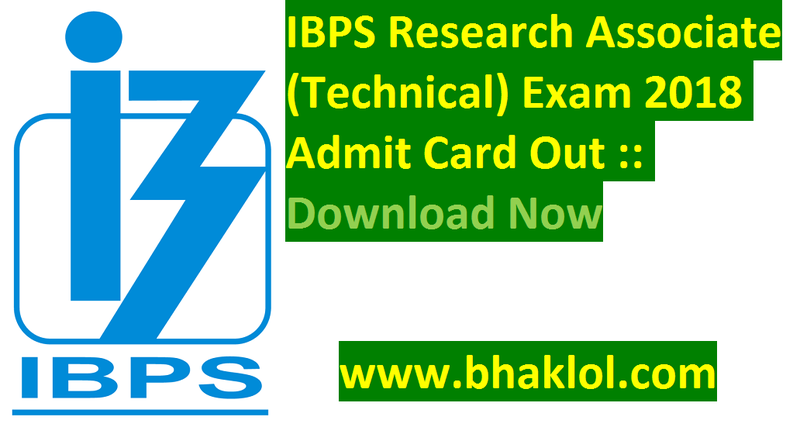 Institute of Banking and Personnel Selection(IBPS) has released Admit Card for its Research Associate(Technical) Recruitment Examination 2018 which is scheduled on 28th January. 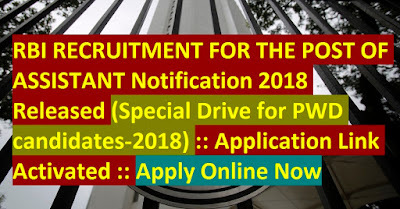 Uttar Pradesh Police Recruitment and Promotion Board(UPPRPB), Lucknow has activated 41520 Constables Recruitment 2018 Online Application Link. Now the eligible and interested candidates may apply online for this recruitment from the link Mentioned below. Dear Students, State Bank of India has released notification for the recruitment of 8301 Clerks at its Branches across the country. Online Registration of Application for SBI Clerk 2018-19 is going on, its will go till 10th February 2018. We are sharing Important Dates of SBI Clerk Recruitment 2018. 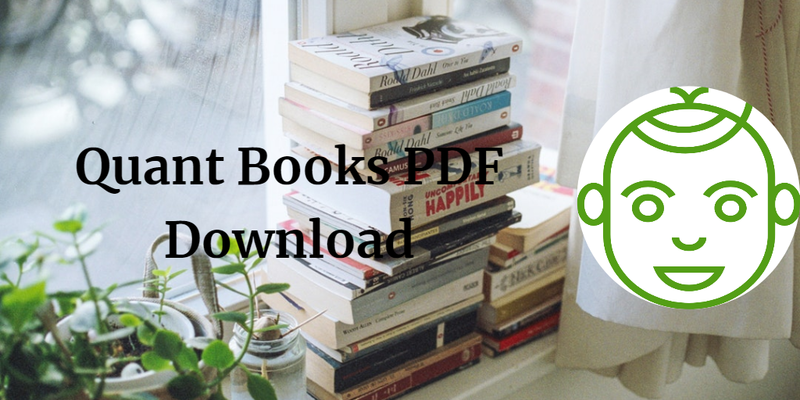 Dear Students, we are sharing Quick PDF Links to Access English Books for Bank and SSC Examinations. 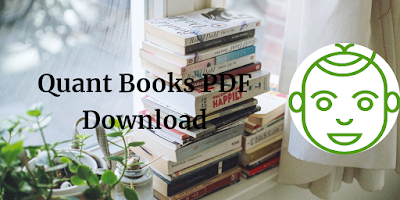 These all books are very very important to read to clear cutoff scores in IBPS Exams, SSC Exams, SBI Exams, RBI Exams and in other competitive examinations because all the basics to standard questions of English which are asking in the exams these days are given. 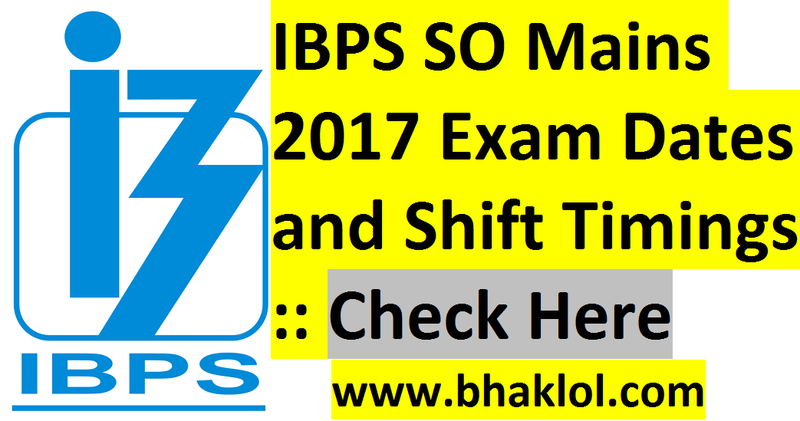 Dear Students, Score Card / Marksheet of IBPS SO Prelims 2017 Online Examination has been released. 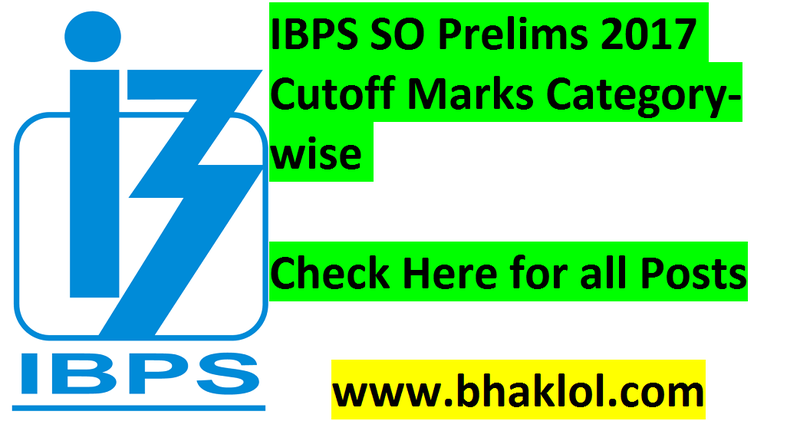 Now we are sharing cutoff scores of IBPS SO Prelims 2017-18. 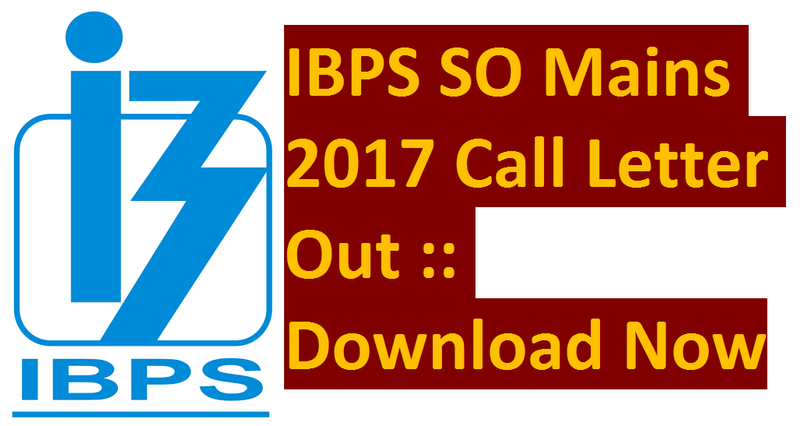 Dear Aspirants, IBPS has released call letter for its IBPS SO Mains 2017 Online Examination. Now, We are sharing exam dates and shift timings of SO Mains 2017 Exam. 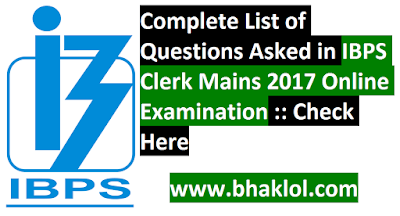 Dear Students, we are sharing Complete List of Questions which have been Asked in IBPS Clerk Mains 2017 Online Examination today on 21st January 2018. Most of the questions are memory based. Complete GK questions we have share, you may answers all those questions answer in comment sections. Dear Students, IBPS Clerk Main Online Examination 2017 was held today on 21st January 2018 from 8:00 AM Reporting Time. Actual Exam Timing was from 09:00AM to 11:40AM. Now the examination is over. We are here with detailed exam Analysis of IBPS Clerk Main 2017 Onine Examination and also we have predicted Cut Off Score of IBPS Clerk Main 2017. As per feedback from the students who took this examination, overall difficulty level of IBPS Clerk Mains 2017 was moderate to difficult level.No inequality questions asked in reasoning. This time also puzzle was the queen topic in Reasoning Subject. 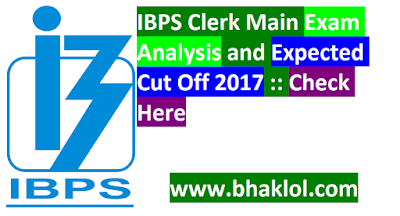 Overall paper was time consuming.We have shared IBPS Clerk Main Exam Analysis and Expected Cut Off 2017, go through it. 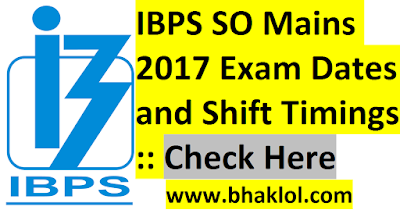 Dear Students, IBPS Clerk Mains 2017 Online Examination is over now, it was scheduled today on 21.01.2017 from 08am(Reporting Time) to 11:40am. Now the students who took this examination , please share the review. Public Service Commission, Allahabad has released the result of UPPSC Prelims 2017 Examination. PSC, Allahabad has released list of shortlisted candidates for UPPSC Mains 2017. Around 2.5 lakhs candidates appeared in Preliminary Examinations. Click Here to Download PDF of LIST OF CANDIDATES QUALIFIED FOR COMBINED STATE/UPPER SUBORDINATE SERVICES (MAIN) EXAM-2017. 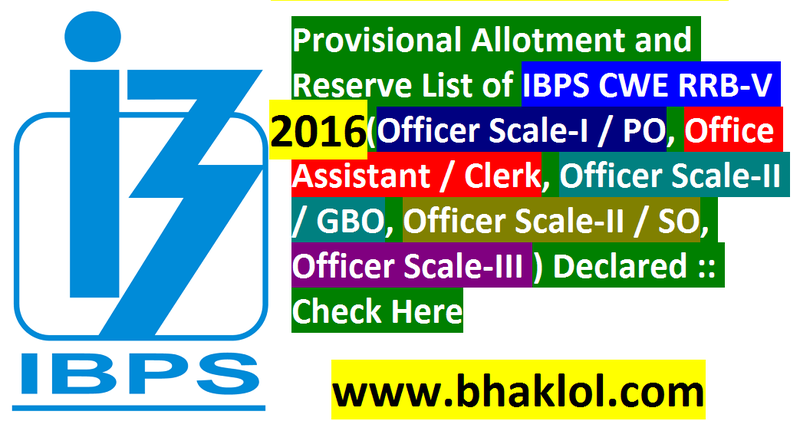 Institute of Banking and Personnel Selection(IBPS) has released call letter for its CWE-VII Mains Online examination for Specialist Officers. IBPS SO Online Mains Examination 2017 is scheduled to be conducted on 28th January 2018. Reserve Bank of India(RBI) has released the result its Assistant Officers Mains Online Examination which was held on 20th December 2017. RBI has released Roll Numbers of Provisionally Shortlisted Candidates. The candidates who appeared in this examination can check his/her result status now. Staff Selection Commission(SSC) has released the admit card for SSC MTS(Non-Technical) Tier-2 examination which is held on 28th January 2018. All those candidates who qualified for Tier-2 exam can download his/her call letter from your regional SSC website. Dear Students, On the basis of performance in Tier-I exam (objective type) held on 15.10.2017 for the post of ACIO-II/Exe in IB, the list of roll numbers and registration numbers of the shortlisted candidates have been released for Tier-II exam scheduled to be held on 25.2.18 (Sunday), admit cards for which would be sent at the registered email ID of candidates.